I am still in the archives of the State Library of Queensland (via Wikimedia Commons, via my desktop computer) for my featured photograph of the week. 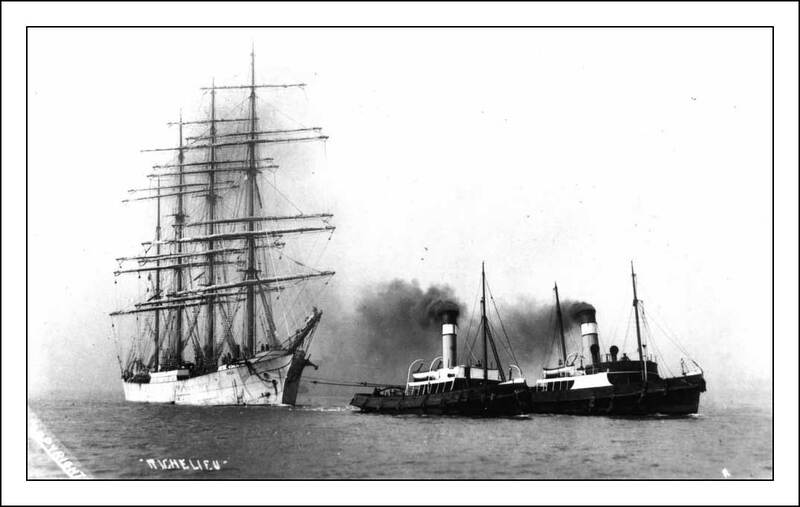 The photograph shows the four-masted barque, "Richelieu" under tow from two tug-boats. The steel sailing boat was built in Germany in 1916, named the "Pola" and originally intended for the South American nitrate trade. Her delivery was delayed by World War I and in 1919 she was seized by the Allies as part of post-war reparations, and handed to the French who renamed her the "Richelieu". Her sailing days came to an end in 1927 when her cargo of pitch caught fire in Baltimore Harbour. The archive image is of uncertain date and unknown author, but it is one of the 50,000 archive images generously handed over on a copyright free basis by the Queensland Library to Wikimedia Commons. All lovers of old images will welcome such a move which allows enthusiasts all over the world to enjoy this rich treasure-house of historical images. You can add to our very own Sepia Saturday treasure-house by linking your posts to the Sepia Saturday Blog using the Linky Form below. Post your post (on or around Saturday 26 February), add your name and the post URL to the Linky Form and leave us a comment to let us know you are joining in. If you want a theme, there are themes galore in my featured image, but remember you don't have to follow any theme. Think image, think old, think Sepia Saturday. 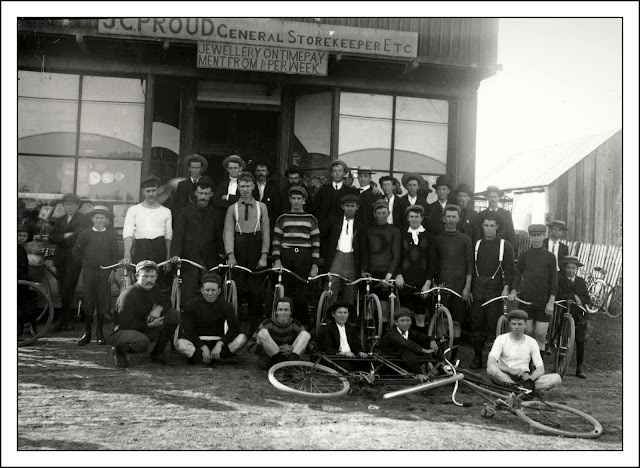 My featured archive image this week focuses on the Ipswich Cycle Club and dates back to the very beginning of the twentieth century. In case you are about to criticise me for a notable lack of geographic adventurousness, let me quickly assure you that the Ipswich concerned is the antipodean inception - just outside the city of Brisbane - rather than the one in Suffolk, England (or, for that matter, the one in Massachusetts, or the one in South Dakota). For the "themers" amongst us, they can seize on bicycles, or bare knees, general storekeepers, or even the multiple inceptions of Ipswich. For the "non-themers" (someone called us "memers" the other day and I rather like that) amongst us, they can go where the spirit takes them and post whatever old image they want to. So, "themer" or "memer", just hop on your bike and pedal your post on the Sepia Saturday Blog by linking it to the following list on or around Saturday the 19th February 2011. Ding, ding! This photograph is listed in the catalogue of Florida State Library simply as "Men Standing By A Silo". 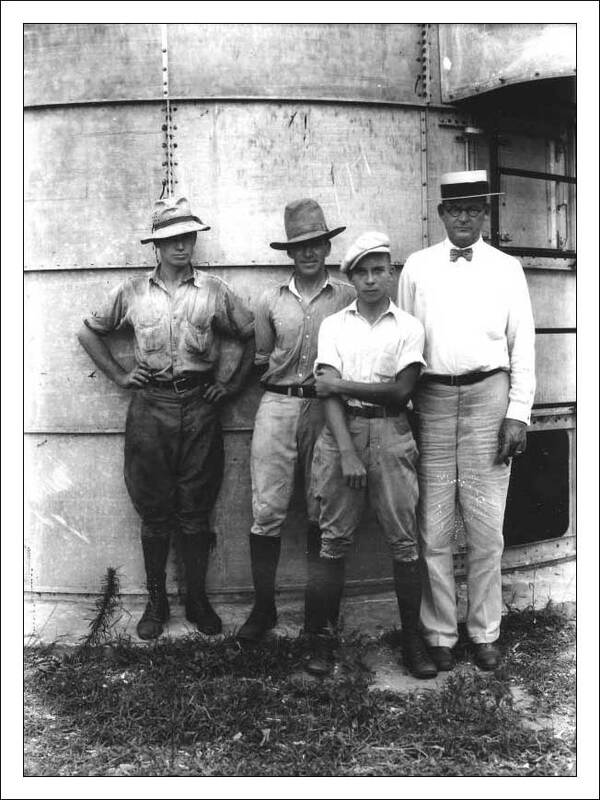 There is no record of the photographer, no date, and there are no names of the four men themselves. It is listed as being part of the photographic collection of the Agricultural Experiment Station, so we can perhaps assume that they are State employees rather than independent farmers. Two connected things made this photograph stand out to me : the prosaic nature of the given title and the anything but prosaic body language of the four men in question. Each one is a chapter in itself and together they form a book-full of stories and personalities. And like a fine impressionist painting you can read your own interpretation of the lines and shapes that make up the scene. Sepia Saturday 60 achieved, I think, a record number of participants and it was great to visit all the posts and see such a wide variety of subjects and interpretations. Remember, you don't need a silo-full of old family photographs to join in with Sepia Saturday, all you need is an old image and a new thought. You can follow the theme if you wish (if you can find one) or you can explore your own path through your own little bit of history. Try to get around as many of the other Sepia contributors as you can : and don't forget the latecomers, it is always worth a return visit once Saturday is over to check-out new posts. Sepia Saturday 61 will take place on or around Saturday 12th February 2011. Come and join us ..... or the little chap wearing the cap stood in front of the silo might just punch you on the nose!